There really isn’t anything quite as quirky as a tradition and over here in England, now that the sun has finally started to shine, we are starting to look forwards to some of the activities that make our summer so quintessentially English. Here are 5 summertime traditions that will make you smile, laugh or shake your head in bemused puzzlement. Every summer we Brits flock to the beaches in our thousands to build sandcastles. There are many reasons why sandcastle building isn’t the most satisfying of occupations, for a start sand wasn’t designed to stick together and even the simplest of sandcastle bucket shapes will result in an edifice with at least one missing corner. However, despite the disappointment of realising that none of us are actually the next Norman Foster, we Brits are masochistic enough to enjoy the bliss of careful creation closely followed by cruel destruction from either the sea, the neighbour’s dog or our own children. Statistics (who knew there were such things) suggest that although the percentage of us who enjoy sandcastle building is declining, 69% of English people are still happy to admit that it is one of their favourite seaside occupations. You wouldn’t think, would you that something as simple as a cup of tea, a scone, some jam and a blob of clotted cream (a thick, buttery cream) would be the subject of controversy and inter-county argument. However, if you visit the South West of England and mention the subject of cream teas you will find deep-seated resentments bubbling beneath the surface of what is supposed to be a convivial and genteel English tradition. The issue here is regarding the order in which you place your cream and your jam onto your scone. If you live in Devon the accepted method is cream first then jam, however if you cross the River Tamar (we have a bridge, you won’t need to swim) you will be required to remember that in Cornwall (England’s most Westerly county) jam should be placed before cream. Make no mistake, Devonshire and Cornwall folk can spin out the cream or jam argument until the cows come home. If you add this to the differences in pronunciation of the word ‘scone’ and the hatred that some people have for sultanas in their otherwise plain scones, you might find yourself wondering if it might be easier to go and eat instead that other traditional British summertime food, fish and chips. The summer solstice falls between June 20th and June 22nd in the Northern Hemisphere and is the day of the year which experiences the most daylight hours as the earth tilts towards the sun. This day is celebrated around the world but particularly in Europe. In the UK our celebrations are based on pagan rituals that generally revolve around sunrise on the longest day. One of the most popular destinations for summer solstice revelers is the ancient and mysterious stone circle of Stonehenge. If you want to appreciate the stones’ enigmatic and intriguing presence however, the summer solstice is not the best time at which to visit. On that day over 20,000 people will gather to watch the sunrise and take part in celebrations and rituals. For some, particularly druids, this is a religious experience whilst others see it as a good reason for a party. Whichever way you look at it, the summer solstice celebrations at Stonehenge must be a far cry from the solemn occasions that its Bronze Age builders anticipated. We English are quite good at cheese. We have the universally popular Cheddar, the ‘cracking’ Wensleydale, made popular by Wallace and Gromit in the animation ‘The Wrong Trousers’ and the historic blue Stilton, to mention but a few. Not satisfied with eating our delectable dairy product, we have also found a way to put cheese on our sporting calendar. The annual Gloucester Cheese Rolling event involves people chasing a traditional Double Gloucester cheese down the impossibly steep and uneven Cooper’s Hill in Gloucestershire. The Cooper’s Hill Cheese Rolling event is so dangerous that in 2010 it was officially cancelled. Despite this and in face of warnings from the local authority, the event continues and every year huge crowds gather to watch the spectacle. In 1997 thirty-three competitors were treated for injuries including broken bones. This has to be one of the more bizarre British summer traditions but it is a firm favourite. You would be forgiven for asking what type of enormous prize would be enough to reward people for risking life and limb in such a way; the answer of course is the cheese itself. If on a sunny English evening as you enjoy a stroll or a delicious pub meal, you are surprised by a group of strangely dressed and beribboned men and women jumping around and waving sticks, don’t be too disconcerted, it is only the local morris dancers and, contrary maybe to first impression, they are there to entertain rather than frighten. 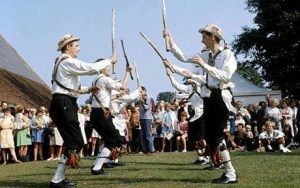 Morris dancing is a form of traditional folk dancing that even before the time of Elizabeth I was considered to already be ancient. The dances are performed in groups or ‘sets’ to traditional music and are a combination of repetitive steps that often involve banging sticks or waving handkerchiefs. Costumes vary across the UK but habitually include bell pads round the ankles, ribbons for movement and either a ‘baldrick’ (an arrangement of straps across the chest) or a waistcoat. Some morris groups have a ‘fool’ whose job it is to interact with the audience and pass comment on the poor performance of the dancers. The fool often carries a short stick with an inflated pig’s bladder attached to it. Looking for interesting ways to learn English? We have some famous movie quotes for you. Donald Trump is President of the United States now but how did his simple use of the English language help him to get there?